The new INSIGHTqc controller for critical assembly manufacturing applications will make its debut at Motek 2018. Ingersoll Rand, along with its partner distributors, DWT GmbH and MINT GmbH will introduce new products for critical assembly manufacturing applications at Motek 2018 which takes place from 8 – 11 October in Stuttgart, Germany. Motek is the international trade fair for automation and production in assembly and Ingersoll Rand will showcase solution-oriented power tools and assembly systems and premiere the new INSIGHTqc controller for critical assembly manufacturing applications. The controller helps manufacturers, such as those in heavy equipment, automotive and aerospace, who require advanced fastening strategies, to take control of their assembly processes quickly. 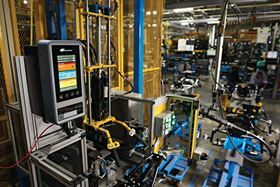 The controller powers Ingersoll Rand’s QE Series and QM Series’ direct current precision assembly tools (DC tools) and collects data that manufacturers can act on in order to improve production.